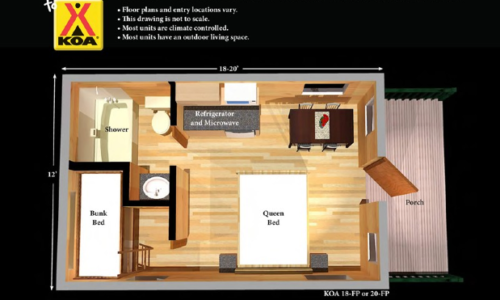 These units have full bathrooms and some have kitchenette. 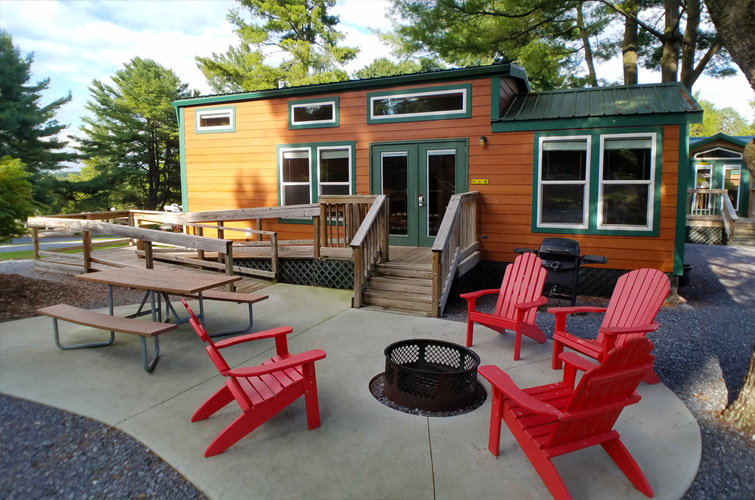 All units have fire rings, picnic tables, outside propane grill, patio and outdoor chairs. Check-in starts at 3pm. Sorry, no early arrivals. No daily housekeeping service / no towels. 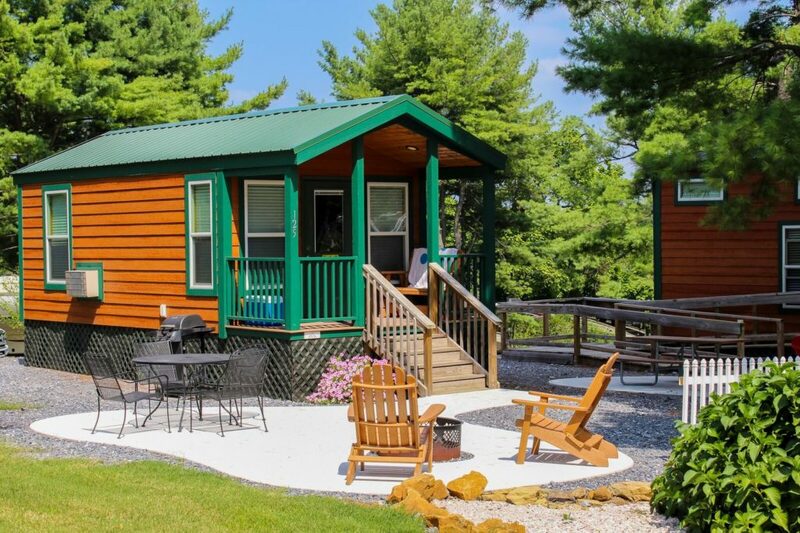 The Studio Deluxe Cabin is perfect for a family of 4 (2 adults & 2 children or 3 adults max. 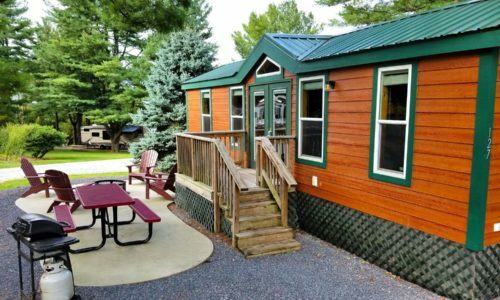 ), looking to upgrade from a cabin to a rental with a bathroom. 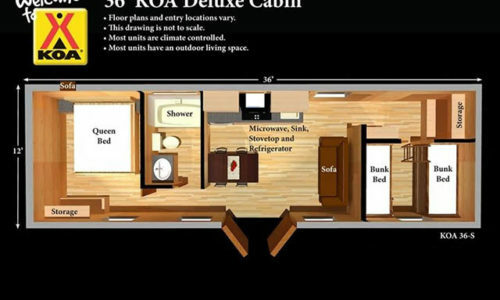 The Studio is a little bigger than a standard one-room cabin, has a queen bed and set of bunks. 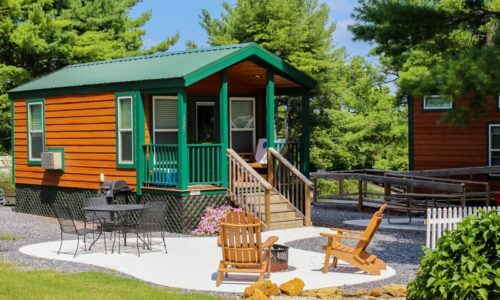 Includes heat / AC, studio refrigerator, microwave, K-cup coffee brewer (bring your own coffee), TV with cable and even has a covered front porch. Cook that steak on a gas bbq grill. Basic bed linen packs with pillows & light blanket are provided. No towels or housekeeping services provided. Top bunk (made for child) has a 150 pound weight limit. No utensils supplied. No cribs / pack and plays or indoor cooking allowed. 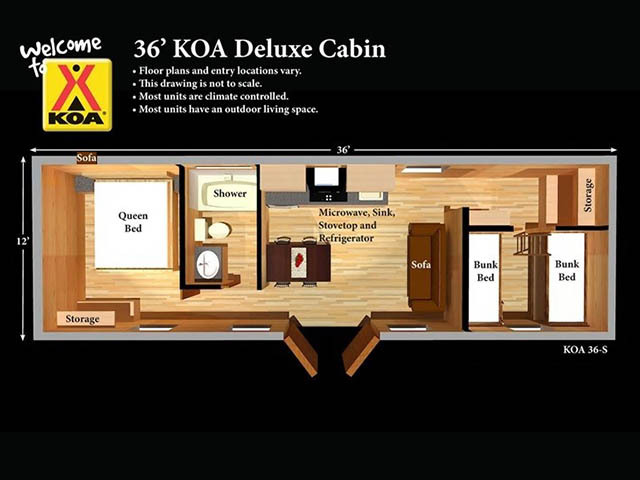 Our Large Deluxe Cabins sleep up to a maximum of 6 (2 adults & 4 children or max 4 adults only). 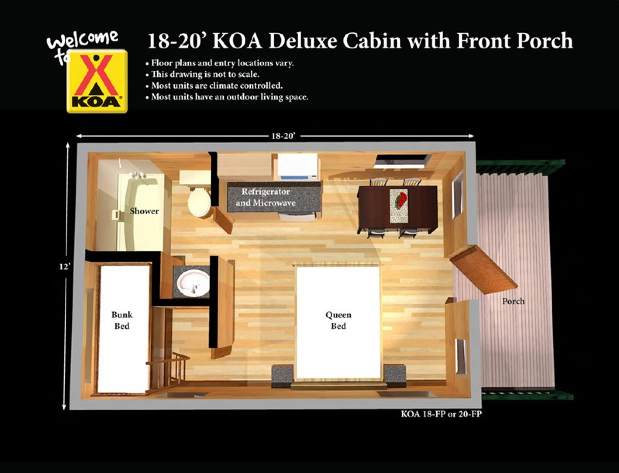 A bedroom with a queen bed for two and a separate bedroom with 4 bunks (top bunk, made for a child, has a 150 pound weight limit.) 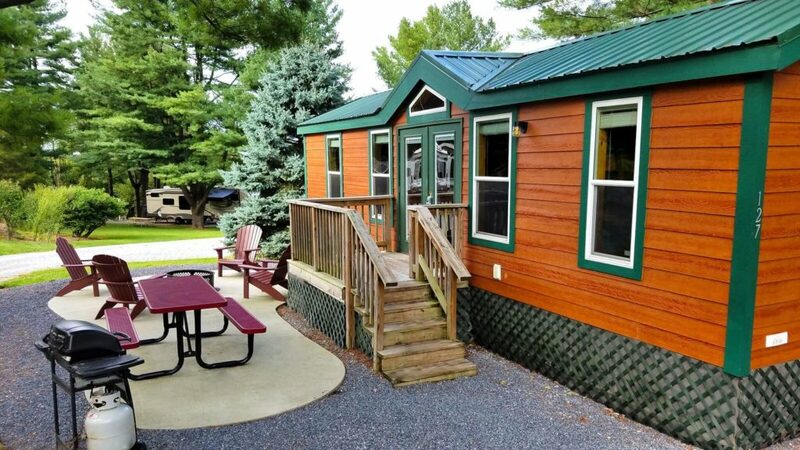 These units feature a full bath, cooktop, small refrigerator, sink, heat and AC, microwave, K-cup coffee brewer (bring your own coffee) and a TV with cable. Dishes, cups, utensils, cookware are already here! Basic bed linen with pillows, light blankets are provided. No towels or housekeeping services. 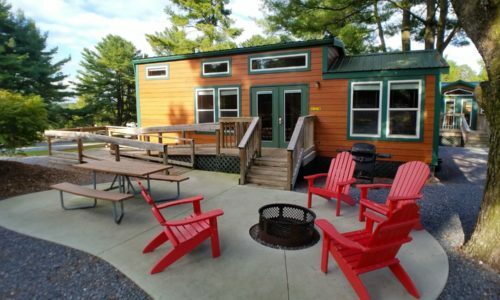 Our Loft Deluxe Cabin sleeps up to a maximum of 5 persons (max of 3 adults). 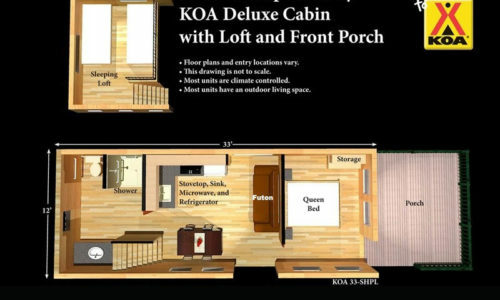 A queen bed for two and a loft with 2 twin floor mattress plus a futon. 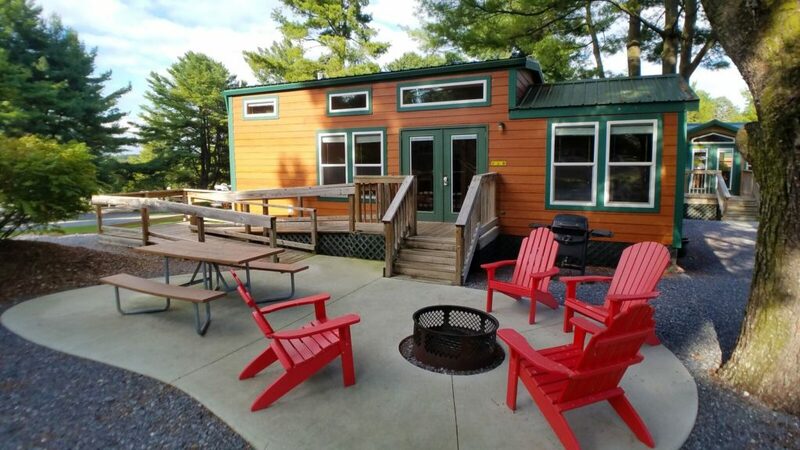 This unit features a full bath, cooktop, small refrigerator, sink, heat and AC, microwave, K-cup coffee brewer (bring your own coffee) and a TV with cable. 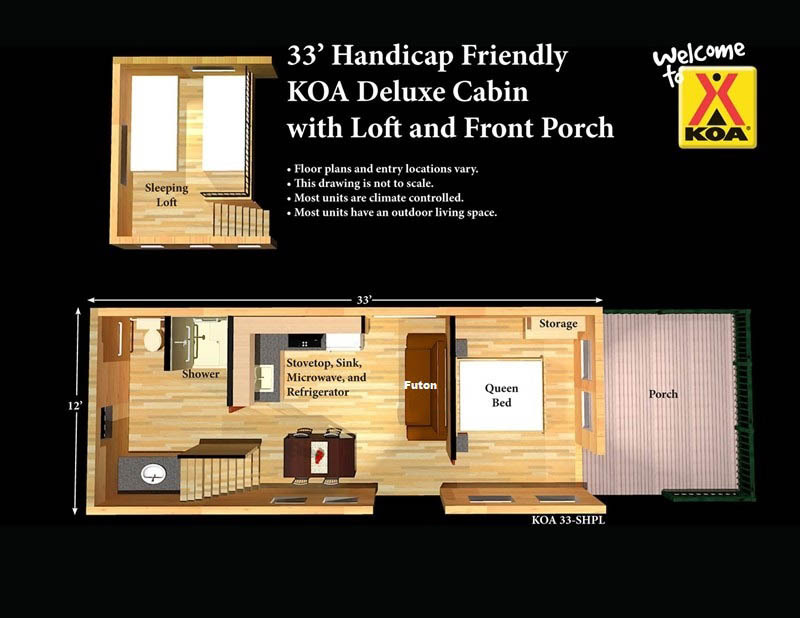 This unit is also handicap friendly. Dishes, cups, utensils, cookware are already here! Basic bed linen with pillows, light blankets are provided. Sorry, no daily housekeeping service provided. Floor plans may vary slightly.